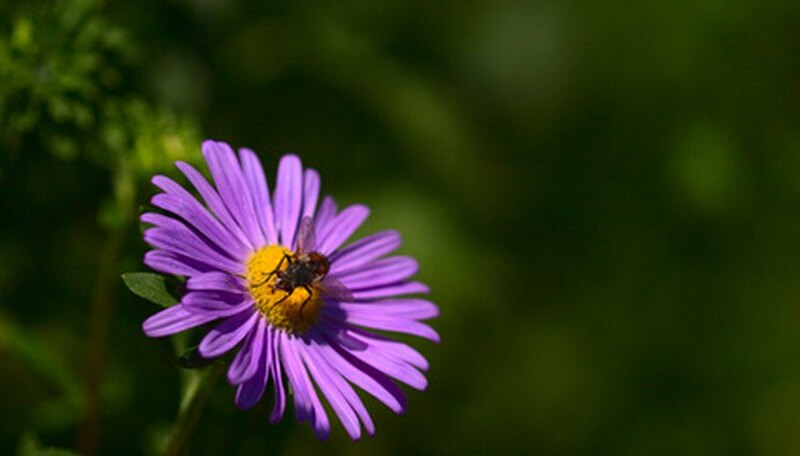 Asters, also known as Michaelmas daisies, are fall-blooming perennials that come in a large variety of colors and sizes, according to the University of Illinois. Asters can range in size from 6 inches to 6 feet tall, although in most cases the taller varieties need to be staked. Asters grow best in full sun with well-drained soil that is kept moist. Even though asters bloom in the fall, they still need winter protection. Remove the aster blooms as they fade. Pinch them off at the base of the stem with your thumb and fingers. Divide your asters, if needed, in the fall after they finish blooming. Dig up the established plants and separate them into two different plants. Plant each new aster in a hole as deep as the root ball and twice as wide. Fill the holes with soil. Water the ground around the asters well before it freezes. Make sure the ground is moist but not soaked. Cut the asters down to the ground after the ground freezes. Cover the asters with 2 to 3 inches of mulch to protect the roots during the winter.